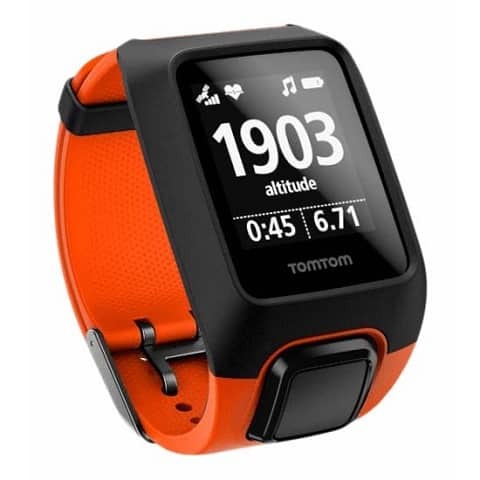 The relatively new TomTom Adventurer GPS Watch is one of the must-have products for modern athletes. The watch is a versatile multisport device that boasts a number of vital features. As the name suggests, the watch is for different outdoor sports and adventures. This includes hiking, mountain climbing, swimming, snowboarding, running, and other extreme sports. The watch is a great multi-sport GPS tracker, an activity tracker, a heart rate monitor, and a music player all in one device. When compared to other watches, the TomTom Adventurer offers these features at a more reasonable price. The way this is achieved by the company is by placing only the necessary features on the device for athletes to reach their goals and nothing else. Compared to its predecessor, the TomTom Spark, the new Adventurer smartwatch sports an updated design. It is also more rugged and can withstand additional abuse. The watch is waterproof up to 130 feet, which means that it will be usable for extreme water sports. The TomTom Adventurer also sports a new band design that is much better than the one found on the Spark. While there are better-looking sports trackers out there, the Adventurer is still great to look at in its simplicity. The watch doesn’t have a full-color screen with complex graphics, but its monochrome display still does the job. Having a simple monochrome display also means that battery life with the watch is also much longer. In fact, the TomTom Adventurer can last up to 3 weeks of activity tracking without GPS enabled. With GPS enabled, the watch can last up to 11 hours on a single charge. With a multitude of sensors, the Adventurer offers users a number of unique activity profiles for different sports. This is possible through the use of built-in sensors such as a barometer, compass, GPS, and a heart rate monitor. These profiles track different stats for different activities. This includes steps, altitude, pace, distance, heart rate, speed, and even the total calories burnt. However, what really sets the TomTom Adventurer apart from its competitors is its ability to let users upload their own routes. In addition to its basic sports tracking features, the watch lets users upload their own custom GPX routes to the watch. Users can use the feature through the use of the TomTom web app. The uploaded GPX routes then reflect on the watch and are immediately ready for use. Those that want to enjoy their music without having to drag their phones with them will appreciate the watch’s built-in music feature. The TomTom Adventurer has 3GB of built-in storage, which is only used to store music. Users can control their music through the watch’s playback controls, which are easy to use. The TomTom Adventurer GPS sports watch is a no-frills tracker that will be perfect for those who do not want any unwanted distractions. Given its price, the Adventurer does sports some very robust tracking features not found on similarly priced products. With a multitude of built-in sensors, activity profiles, and a free Bluetooth headset, the Adventurer is undoubtedly great value for money.